Google Sheets can be used to store various types of data. It could be Names, Address, long form text, links, etc. In most of the cases, when the text in the cell is long and goes out to the cell, there is a need to wrap it within the cell. 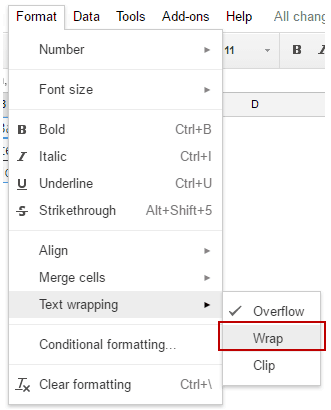 In this tutorial, you’ll learn how to wrap text in Google Sheets. 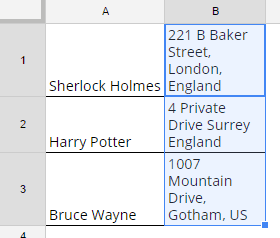 Note that since the address is longer than the width of the cell, it overflow and extends out of the cell. You may want to keep it within the cell if you have more text in adjacent cells (or simply for aesthetic purposes). Select all the cells for which you want to wrap text. Go to Format –> Text Wrapping –> Wrap. This would wrap the text and make it fit within the cell. Note that this will auto fit the row height to adjust the content in the cell. There is another option to clip the text. You may want to use it when you want to maintain data but don’t want to read it. For example, URLs can be a great example where you may want to use the clip option. Note that this wouldn’t clip the URL or any text in the cell, it will simply display you a clipped version. How to Quickly Split Text in Google Sheets. How to Rotate Text in Google Sheets.